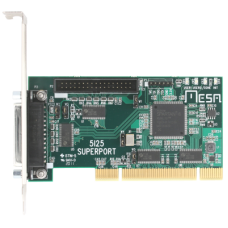 The MESA 5I25 is a low cost, general purpose, FPGA based programmable I/O card for the PCI bus. The 5I25 is a low profile PCI card (available with low profile and standard brackets, low profile bracket shown here) that uses standard parallel port pinouts and connectors for compatibilty with most parallel port interfaced motion control / CNC breakout cards/ multi axis step motor drives, allowing a motion control performance boost while retaining a reliable real time PCI interface. Unlike the parallel port that the 5I25 replaces, each I/O bit has individually programmable direction and function. 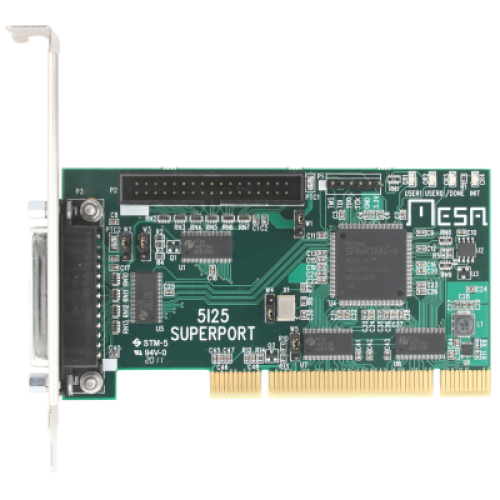 The 5I25 is a universal PCI card so will work in 5V and 3.3V systems. the 5I25 provides 34 I/O bits (17 per connector) All I/O bits are 5V tolerant and have pullup resistors. A power source option allows the 5I25 to supply 5V power to breakout boards if desired. This 5V power is protected by a PTC. Firmware modules are provided for hardware step generation, quadrature encoder counting, PWM generation, digital I/O, Smart Serial remote I/O, BISS, SSI, SPI, UART interfaces and more. Configurations are available that are compatible with common breakout cards and multi axis step motor drives like the Gecko G540. All motion control firmware is open source and easily modified to support new functions or different mixes of functions. 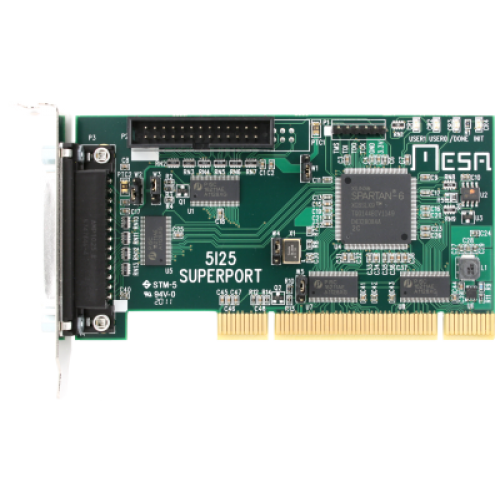 There are currently six 5I25 compatible breakout cards available from Mesa, the 7I74 through 7I78 and 7I85. The 7I76 is a step/dir oriented breakout with 5 axis of buffered step/dir outputs, one spindle encoder input, one isolated 0-10V analog spindle speed plus isolated direction and enable outputs, one RS-422 expansion port, 32 isolated 5-32V inputs and 16 isolated 5-32V 300 mA outputs. The 7I77 is a analog servo interface with 6 encoder inputs, 6 analog +-10V outputs, one RS-422 expansion port, 32 isolated 5-32V inputs, and 16 isolated 5-32V 300 mA outputs. The 5I25 supports two breakout cards so for example a 10 Axis step/dir configuration or 12 axis analog servo configuration is possible with a single 5I25 and two Mesa breakout cards.